Raise your hand if you still listen to the radio. Okay, this review is for you guys. The rest of you, go read some game reviews or something. So Radiophone…it’s about what it sounds like. 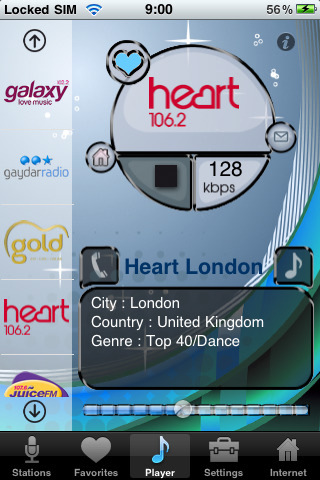 It’s an app that lets you play the radio over your phone. I didn’t delve too deep into the technical aspects, but it seems to just be tapping into the web streams of various broadcast radio stations around the world, so the quality is always only going to be as good as your Internet connection. You can filter the big list of stations based on country and type of music, and you can add stations to a list of favorites for easy access. Let’s not beat around the bush too much; Radiophone has some pretty major issues. The station search is easy to use and generally straightforward, but the list of stations was far from comprehensive and the categories are often messy, with things like competing entries for “News Music” and “News/Music”, each pulling separate lists. There’s also no way to limit the search filter by region, only country. This might not be such a problem if you’re looking for Latvian dance music, but it means stations in San Francisco get tangled with ones in Atlanta and New York, and there’s no easy way to tell which is which. The player is also a lot on the cluttered side, with buttons leading to the station’s webpage, phone number, etc. Unless you’re the type who just lives for call-in shows, this kind of extra isn’t going to appeal. Trying to get to the app info is also a pain. Clicking the familiar “i” icon leads to an image of an old-timey radio with four screws on the corner. You have to “dismantle” the radio to uncover a link to the info menu. It’s a cute idea for a game, but I was just trying to listen to the stupid radio! And the menu is just one, long, nightmare scroll of information. To top it all off, Radiophone has the unfortunate tendency of crashing without warning every once in awhile. Bottom line, if you’re still listening to the radio, save yourself the headache and tune into a different app. AppSafari review of Radiophone was written by Tracy Yonemoto on March 30th, 2010 and categorized under App Store, Music, Radio. Page viewed 3778 times, 2 so far today. Need help on using these apps? Please read the Help Page.